But this show, from top to bottom, was in complete defiance of all rules. 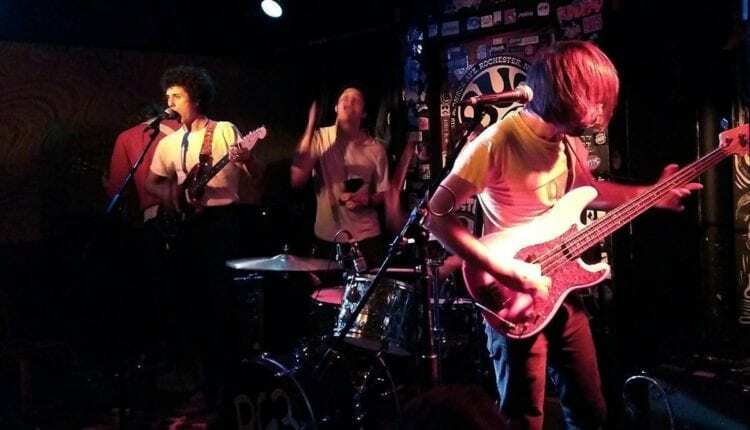 As that’s the very definition of punk, it was very fitting that the show ended with both Ron Gallo’s trio and their tour mates, Seattle trio Naked Giants, all on stage, mostly shirtless, romping through The Stooges’ “TV Eye,” screaming and thrashing about the stage like a group of maniacs. Rules likely also dictate that the opening band will be some half-baked group of local musicians defiling gems from The Stones or trying to work up yet another rendition of “Crazy.” But on this night, the crowd was treated to 40 minutes of excellent original songs from Rochester’s Dangerbyrd. Mixing blues, country and early 60’s psychedelia, they settle comfortably near the sounds of The Band and Credence Clearwater Revival, keeping it simple while nailing it in the process. Next up were the aforementioned Naked Giants, a trio of Gianni Aiello on bass, Grant Mullen on guitar and Henry LaVallee on drums. They played with a frenetic energy, going after every single note with reckless abandon, completely untethered. The set began with a noisy, effects-laden jam, swimming in cymbal crashes. Aiello danced about the stage, somehow still keeping total control of his bass sound which, at times, he seemed to be changing with every other pluck of the strings. They weren’t a band to follow the rules either. The bass was as much a lead as the guitar was and traditional song structure took a back seat to rhythm and pure enjoyment. No one was having more fun than the three on stage. The small stage couldn’t contain LaVallee’s excitement when, just a few songs into the set, he kicked the back door open and ran outside mid-song, the first of many times that door would swing open that night. Mullen shredded impressively throughout their set which included songs like “Slow Dance 2,” “Pyramids,” “Twist” and the closing White Stripes-esque “YaYa.” The energy was infectious and the mostly unfamiliar crowd was smitten by set’s end. 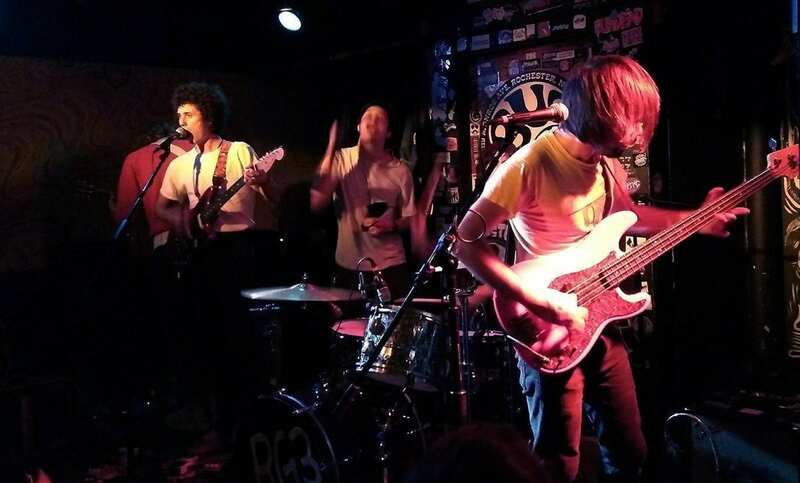 By the time guitarist Ron Gallo and his trio (bassist Joe Bisirri and drummer Dylan Sevey) took the stage, the crowd was at a fever pitch. Gallo played off of this by stepping to the mic, monotonously and stiffly reading from a piece of paper: “My name is Ron Gallo. That is also the name of our band. We are excited to be at the Bug Jar in Rochester New York, one four six oh seven. Thank you and enjoy yourself.” It was the calm before the storm, immediately followed by fuzzed out bass blasts and a heavy guitar jam. Usual rock show protocol would dictate that the guitar player wouldn’t jump into the crowd until late in the show, but Gallo was jamming from within the crowd before the first song even started. The entry jam lead into an opening combo of “Put the Kids to Bed” and “Kill the Medicine Man” off his stellar new album, Heavy Meta. They mixed tracks from the album together with new songs (“Man Keep Your Hands on Your Pants”), older songs (“Really Nice Guys”) and covers (Des’ree’s “You Gotta Be”). When “All the Punks Are Domesticated” got called out from the crowd, Gallo responded,”…is the name of the next song we’re going to play” and launched into it without missing a beat. During the slow dripping, heavy blues of “Black Market Eyes,” Gallo followed LaVallee’s earlier lead and left the stage out the back door. 30 seconds later he returned running through the back of the crowd and back on stage to rejoin the band for a another heavy rock jam.